I finally finished piecing all of the monkey wrench blocks together yesterday and the quilt top is ready to take to a long-arm quilter for that special quilting magic. Yay! My goal is not take another 6 months to drop off the quilt like my last one. 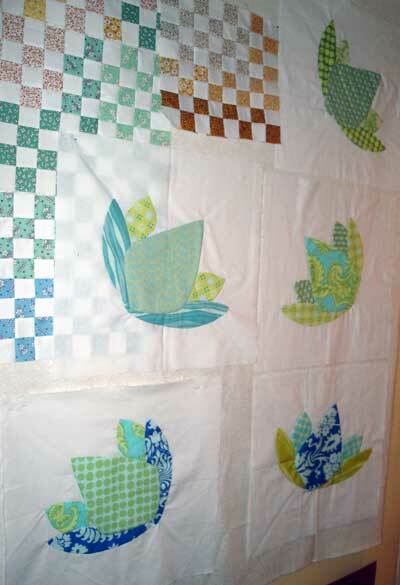 You can see the finished top in my quilts gallery page. In other news, work has been a little trying lately so the only thing that has been keeping me sane is working on a old/new quilt. A while back I wrote about doing needle-turn applique for the first time to make some flower blocks for the Fanciful Flowers quilt (picture available here) featured in the book Material Obsessions. I finally finished the blocks in late December and am now getting around to making the log cabin blocks using the fabric in the picture below. Aren't they so pretty? 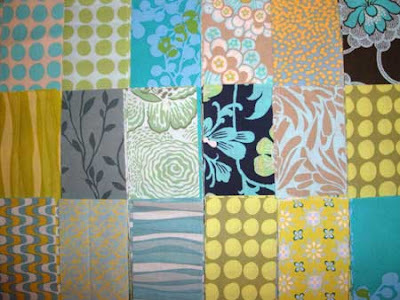 Here are five of the flower blocks. My "design wall" is actually some empty space on one side of a very short and very narrow entry way, hence the very skewed angle of the picture, but you get the idea. The postage stamp blocks partially obscured by the flowers are the left over pieces from my monkey wrench blocks. Not sure what to do with them. Maybe quilted placemats? Or a small handbag? Or a small basket? Maybe put them in a quilt with all my other infinite orphan blocks? No rush as they have been pinned up there for at least a year.